Fighting on the British Warriors show, Bishop scored a 40-36 victory over Lincoln’s debutant Sergio Gugliotta. 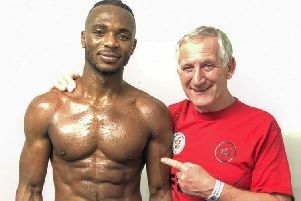 It was exactly five months to the day since the Luton fighter himself had taken his bow in the pro ranks, and he is showing himself to be very well equipped to handle the pressures of the professional game. Bishop was originally slotted to fight his first six rounder but a last minute change put paid to this. Not put off, he produced a slick display, winning all four rounds, landing some heavy shots and switch hitting at will. Gugliotta held a high guard throughout but was unable to stop the clinical body shots of Bishop who was roared on by a huge following. Bishop has yet to lose a round since his debut, and will be looking to continue his rise when he returns to Bethnal Green on February 16.